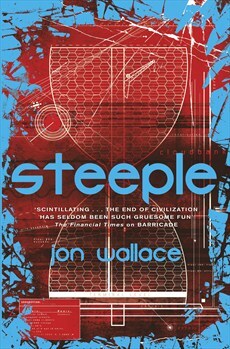 Jon Wallace’s debut novel, Barricade was a blistering, visceral ride through a post-robopocalyptic Britain. It dropped readers into a nuclear blasted landscape and an ongoing war between the ravaged, disease-ridden survivors of humanity (the Reals) and their implacable, seemingly indestructible android foes (the Ficials). Barricade’s protagonist, a Ficial called Kenstibec, emotionless and virtually indestructible, was the perfect guide to this milieu. When Steeple opens Kenstibec, now just Ken, is pretending to be a Real after losing the nanotechnology that allows him to repair himself. Much like Barricade, Steeple wastes little time before sending Kenstibec off on a quest. Sent with his partner-in-crime Fatty (aka Phil) and a woman called Belinda to ascend Hope Tower, a massive residential building in the heart of London that has somehow survived the nuclear exchange. Kenstibec, never one to take orders, has his own reasons for going. Steeple is all action – Kenstibec and his companions lurching from one nasty, violent, stress-filled situation to another. But it is also, as its predecessor was, full of mordant humour and sly social commentary – exploring attitudes towards housing, development and consumerism. Flashback sections detail Kenstibec’s involvement in the design and creation of Hope Tower, reflecting Britain’s historical obsession with tower blocks as social change. But Steeple never preaches. Wallace is too busy broadening his world and putting his protagonist into danger – cannibals, security droids, a relentless military Ficial and even the tower itself all out to kill him. While still seemingly unemotional, Kenstibec does grow to some extent in this book. Life as a Real has started to expose some cracks. Wallace’s robopocalyptic Britain is a violent, poisonous and evil place. Not a place a reader would want to live. But Kenstibec’s journey through another corner of this world is once again compulsive and entertaining. So definitely a place worth visiting.